The text of a written constitution or bill of rights is prone to 'drift' or 'slippage' in the meanings of terms. Even if such meanings have not altered over time, because of changes in attitudes and values there may be disagreement with the text’s framers as to the scenarios that are covered or not covered by terms. This article submits that the distinction between the connotation and denotation of a term that has been applied in Australian jurisprudence is useful for determining the meaning of the text through time. The connotation of a term is the generally unchanging bundle of attributes that is central to the term’s meaning. A term’s connotation determines the scope of its denotation – the collection of things or scenarios to which the term refers. The denotation will be wider (that is, the term’s essential meaning will apply to more things or scenarios) when the term expresses abstract concepts. Unlike connotation, denotation can expand or shrink over time. © 2010. This is a pre-print version of an article that is published as (2010) 31(3) Statute Law Review 217–237 which is available at http://slr.oxfordjournals.org/content/31/3/217.full.pdf. Jack Tsen-Ta Lee. 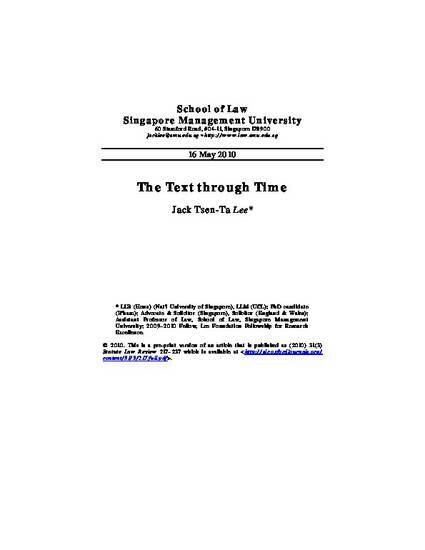 "The Text through Time" Statute Law Review 31.3 (2010): 217-237.